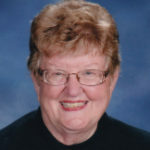 Lorraine Dykstra, 79, of Orange City, Iowa, passed away Friday, Oct. 5, 2018, at Happy Siesta Care Center, Remsen, Iowa. Funeral service is at 10:30 a.m. Wednesday, Oct. 10, at Trinity Reformed Church, Orange City, with interment in West Lawn Cemetery, Orange City. Lorraine Faye Gayer was born on May 20, 1939, in Hudson, South Dakota, daughter of Fred “Fritz” and Verna (Tverberg) Gayer, Jr. She was raised on a farm near Rock Valley, Iowa, where she graduated from high school. On June 7, 1960, she married Kenneth Aalberts. They made their home in Orange City where she was a homemaker and secretary for Sioux County Extension Service and the Soil Conservation Service. Her husband passed away Dec. 24, 1974. On May 24, 1980, she married Roger Van’t Hof. The couple continued to live in Orange City, where she also served as secretary of the Maurice-Orange City Community School District board of education and City of Orange City. She also worked part-time at the Coast-to-Coast Store, Bomgaars Supply Store, Dutch Bakery, and Trinity Reformed Church, all in Orange City. Roger passed away on Oct. 2, 2013. On July 11, 2015, she married Alfred Dykstra. The couple continued to live in Orange City. Survivors include her husband; a son, David (Gail) Aalberts of Spencer, Iowa; son-in-law, Gerry (Deb) Bomgaars of Orange City; stepdaughter, Darsha (Ron) Tuenge of Rock Rapids, Iowa; three stepsons, Dan (Cindy) Van’t Hof of Sioux Falls, South Dakota, Doug (Lisa) Van’t Hof of Lester, Iowa, and Darren (Tricia) Van’t Hof of St. Louis, Missouri; three grandchildren; 11 stepgrandchildren; three step-grandsons; one great-granddaughter; 10 stepgreat-grandchildren; five sisters and two brothers, Janet Renes of Sioux Center, Iowa, Howard (Janice) Gayer of Alton, Iowa, Les (Helene) Gayer of Orange City, Lois (Paul) De Leeuw of Hull, Iowa, Marlys (Rob) Etter of Washta, Iowa, June (Marlo) Voetberg of Marcus, Iowa, and Rhonda (Jeff) Haverhals, of Sioux Falls, South Dakota. In addition to her parents and first two husbands, she was preceded in death by a daughter, Kerri Bomgaars, a sister, Ruth (Cornie) Jansen; a brother-in-law, John Renes, and a sister-in-law, Muriel Gayer.